It's not over, but in many ways this winter already ranks as one of our best ever. Looking back at the stories we've posted since November, we've racked up more hours thermaling and exploring every possible corner of the island than ever before. We've scored numerous personal bests for distance and destinations, and many of us have flown sites and routes for the first time. And in between the epic thermal and cross county days, we've enjoyed some mellow days cruising at our coastal soaring sites. Our fickle winter conditions haven't been easy to figure out, but a dedicated crew has been out there chasing it hard almost every day. So after all that, and after a morning chasing it to Dillingham and back, Sunday's sunset thermal flight between Kahana and Punaluu was the most beautiful welcome home. Sunday started out like any day this winter, with the usual routine for weather assessment. We examine the forecast carefully, then laugh maniacally, crumple it up and throw it out the window. Then we look out that window, and squint up at the sky. We may disembowel a small animal and examine the entrails (my cats actually do this for me), or we might toss some chicken bones, or we might check the winds aloft forecast. Whatever will help us augur the best location and timeframe for flying. We expected a postfrontal north flow that was predicted to rapidly veer east and weaken. Plus an unusually low and strong inversion between three and four grand. What we needed to know was how north it would start, how rapidly it would veer and/or weaken, and how east it would end up. Well it started out due north and brisk everywhere. Some of us rushed out to the obvious postfrontal north site, Dillingham. It turned out to be stronger and more east than we prefer it there, but Thom, Drew and I gave it a shot, only to find it really too strong and cross to enjoy. We were confused by the east flow out there because the sensors elsewhere still looked super north. Finally we landed and decided to chase the conditions elsewhere. We survived some interesting launches and landings. Meanwhile reports from Makapuu were of strong north conditions, as expected. We drove past the North Shore where Duck was up at the Motocross launch. He was wondering why the Laniakea sensor was showing super strong north flow while the Kahuku windmills were pointing due east. The flow on launch was super east, so he drove back down and followed us to Kahana. There we found no wind at all, just the lightest of sea breezes, with some strange low wispy clouds flowing slowly offshore out of the south. Drew and Steve ran up to kite their way all over launch and make little test flights as they waited for some actual airflow. At this point Dave posted from Makapuu that it was now the most epic cross country day ever, but he wasn't available to chase it. That's a familiar ruse! 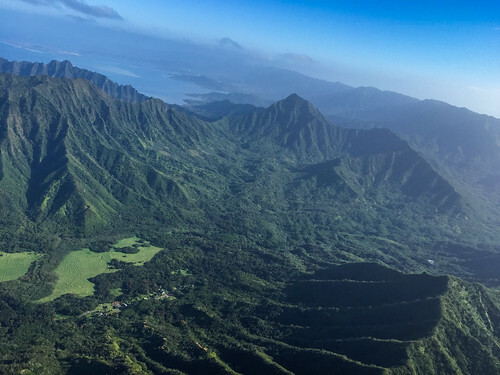 Jorge said Dave flew in his acro glider to Puu O Kona and was going straight up the whole way without turning, clearing three grand before coming back to land and join his family. I heard there were lots of folks over there but apparently no one took Dave up on his promise that they would crush it. We'll never know! Back at Kahana the day was drawing to a close. Spirits were low among the crowd on the beach. Harvey, Jeff, Kevin, Thom, Duck and I watched Drew and Steve cavort and frolic on launch to no avail. Finally I saw what I thought was a slight bump during Drew's umpteenth test flight, and he actually soared for a moment, tormenting Steve who was all snagged on the upper upper upper launch, before top landing again. That was all I needed to see. I grabbed my gear and dashed across the beach, to the uproarious laughter and derision of my compatriots. At least, that's what it felt like. But I was determined to joust with some windmills! Drew and Steve were excited to see me. We all launched and started scratching. Of course we had to kite all the way up to the rock before launching, and then we headed straight to the rhino horn, weaving and dodging each other as we tried to claw our way up. I reached the top of the front and decided it was taking too long, so I rushed straight to the back from there, lower than I've ever gone before. It wasn't a great plan, and sure enough I got nothing but dead air and sink back there, so I limped back out and tried again, more patiently this time. Slowly working my way up the ridge line, I arrived at Puu Piei at ridge height this time, and then I bumbled into one of the best thermals I've felt all year. I turned in that sucker like my life depended on it, gaining almost two thousand feet in a few minutes, topping out around 3,500 feet. I was surprised to see that I'd cleared the inversion. I could see the clear dark blue above and the milky haze below, as the sun lit it up from behind. Man what a cool perspective that was! From there I turned and drifted the rest of the way across Punaluu Valley to Sacred Falls, but the thermals there were not as compliant. I couldn't figure out the drift. It seemed north, or south, or east, or maybe another direction. I really struggled to figure it out, but finally I cored a couple nice ones to get high above the falls, gazing down at the headwaters as the sun was setting. Meanwhile Steve had bailed over the back of Kahana and was headed my way. He asked for my advice. I said: turn in lift, don't go too deep, and keep an LZ in reach. I mean, right? I considered a long glide into the sunset from there, but somehow a return trip to Kahana was more appealing, so I set my course for home, burning back around easily in the light conditions. Drew was still up over there, and Harvey had just launched his big wing. As I arrived over the bay I felt some very strange movement in the air. Like hard jostling and sink. This day was really going south fast. I made a beeline for the beach, and Drew followed. Harvey stayed up a while, long enough for the air to flow definitively offshore at the beach. We watched Harvey come in as the campfire smoke was wafting out over the water. But it was so light it didn't matter, and Harvey's landing was fine. What a crazy day. I can't say I ever quite figured out what the weather was doing. But I think sometimes we have to stop trying to figure it out and just fly, which is what I ended up doing. Of course it was a crap shoot but I was lucky the dice rolled my way this time. Here's to more amazing thermals for all of us before this winter is over. And a little more luck figuring out conditions! Wow, an amazingly beautiful flying video! with perfect music, too. I could watch that over and over. I'd like to fly that over and over. The landing vids were fun to watch, too. Thanks for bringing us along for the ride. And for the tale of the day which was a bugger to figure out. Johnimo and I stopped by Manics, but it was a touch too strong so we went to kite at Sandy's. I wanted to finally get some good dynamic kiting with 1I's Cayenne4 so I could confidently try it someday when conditions are right at a nice launch. I've held onto it way too long trying to find the right days to kite and fly it (THANK YOU JIM for your patience!) It was a good bit lighter at Sandy's and I had to do a lot of sprinting to keep the wing pressurized, but it was better than nothing to keep me from falling further into the deepening vortex of neglected practice of necessary skills. Little did we know, if we had stopped at the LZ, Jorge might have let us know about the perfect conditions up at Cactus. Jorge and Doug each had four flights from 3-4 different MPU launches, including Cactus late in the day. Yes, stop trying to figure it out and just fly. Sounds like your hanging with Drew a bit. Wish you had my launch to make up for this yet another horrid landing. It's been a memorable winter and I am glad your so positive to balance my negativeness. The conditions are getting harder every day to predict...actually impossible unless you happen to be there at the right time. Its Time to Fly, Spread Out to Every Launch and Report!